Yet another Congolese musical hero has gone. Augustin Moniania better known as Roitelet has died on November 8 in Kinshasa. Born in 1934, he was one of the very last survivors from the Tango Ya Ba Wendo (the era of Wendo's people). 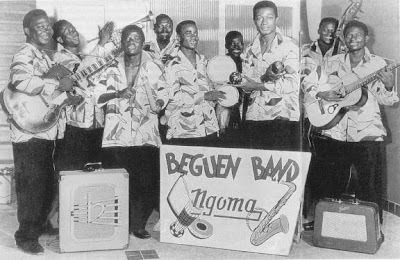 He started his career in the mid-1950s with the CEFA-label, at a time when Belgian guitarist Bill Alexandre introduced the electric guitar into the budding Congolese music scene. There he played with Roger Izeidi, who later played a crucial role in the development of Congolese music (and not only with African Jazz and African Fiesta), and with Victor 'Vicky' Longomba (see a dozen or so other posts on this blog). He went on to play at the Loningisa label (both before and with the O.K. Jazz), with Esengo (with Rock-A-Mambo, African Jazz, and the various combinations) and with the Ngoma label (with the Beguen Band). Roitelet was one of those musicians who constantly popped up over the years, but also a musician who never seems to have committed to one orchestra. Predominantly a bass player, I am told he also played other instruments. I must admit I am not sure which. Despite his longevity in the Congolese music scene I think a lot of people may have problems naming Roitelet's songs. A quick search on the internet confirms this. Some websites appear to credit him for songs like "Tika Kondima Na Zolo" (Loningisa 156, composed by Franco). 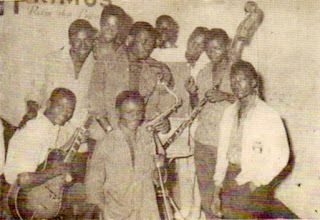 They may have overlooked spectacular songs such as "Anduku Lutshuma" and "Houlala Mopanze", both composed by Roitelet. 03. Nzungu Ya Loso - 'Roitelet et son ensemble' [Esengo 123A]. EDIT November 11, 2014: In my haste to get this post online I added a song twice, with different titles (tracks 8 and 9 of the original upload). This has now been corrected. EDIT November 14, 2014: It still wasn't right. To make up for this messing about I have now also uploaded a flac-version of the nine tracks (besides correcting the mp3-version). The flac-version is available until January 1, 2015.